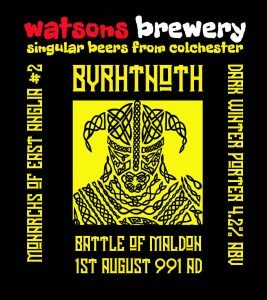 Maldon & Dengie CAMRA inquired as to whether there would be another gyle of Byrhtnoth porter (named after a local hero in olde times in Maldon). As it was a cask-only brew last time, which meant that bottle-drinkers missed out, and as they asked so nicely, I agree. So, casks at the beer fests in Maldon and at Mersea Brewery in April, a keg at Two Brews (on Friday 5th April 2019) and bottles a bit later.